I no longer laugh over the idea that "this gig is making me deaf." Over a lifetime, musicians actually do experience hearing loss because of exposure to loud noise, and protecting one's hearing becomes very important. And sometimes the damage can be worse than a little minor hearing loss. Last week, cellist Janet Horvath, author of Playing Less Hurt: An Injury Prevention Guide for Musicians, wrote an article in The Atlantic called A Musician Afraid of Sound, about her harrowing experience with a condition called hyperacusis, a noise-induced ailment that causes acute and painful sensitivity to sound. In the article, Janet describes being stuck in a bad position at a pops concert, with amplified drums, vocals and electric guitar all blaring directly from a too-close speaker into her left ear. Despite wanting to flee, she went ahead and played. She wore earplugs, but that wasn't enough. I'd encourage you to read the article and to heed its message: protect your ears. I'd also like to share some thoughts and information that I've learned over the years about hearing protection. As I've written before, I think that for an orchestral musician, pops concerts do tend to be the biggest culprit. They are often outdoors, or in large arenas, and they are often amplified. Many, many times, I've emerged from performances of pops concerts feeling almost nauseated by the pain in my ears. It's not just the ringing -- though it is that -- but it can also cause physical pain. Using conventional earplugs can mitigate the damage, in most cases. The problem is that you can't hear yourself with any clarity, as they simply block out noise, and what does come through is full of fuzz. One feels like an artist who is painting while blindfolded. Thus, sometimes I would plug just one ear, or I'd give up and take them out, just so I could hear myself play. The result was still the ringing headache. About seven years ago I spoke about my concerns to a doctor, and I decided to invest in some physician-made earplugs. (I don't know if Janet had the benefit of these, or if they would have helped in the extreme situation she found herself in.) There are a number of kinds of earplugs for musicians; the kind that I have are by a company called Etymotic and can be found here. They were developed specifically for musicians in the Chicago Symphony, by a doctor named Mead Killion, who also just so happens to be an amateur violinist! So they serve the orchestral musician quite well. What they do is attenuate the sound, so you hear all the same things, just a lot softer. They must be fitted to your ear specifically, as they fit in there like a hearing aide, but happily enough, the Etymotic site has a dealer locator service to help people find a physician in their area. I've used the earplugs for loud and highly amplified pops concerts, wearing them for both rehearsals and the concerts. While wearing them, I am able to hear myself clearly, if very softly. They definitely mitigate the effects of playing in an amplified pops concert -- no headache, very little ringing. The only drawback is the slight discomfort of having a foreign object in my ear, but that goes away right after taking them out. And it's worth it! Of course, beyond investing in high-quality earplugs, the other advise is to avoid such situations. But this can be difficult if your employer (or school, or church, youth orchestra, etc.) sets them up. But a little prevention goes a long way; if you do play in an orchestra, talk to other musicians make an effort to collectively address issues such as decibel levels, how close speakers can be placed to players, having plastic sound barriers on hand, having at least some kind of ear plugs available at pops concerts, etc. If you know that a pops concert is on the schedule, make it a point to start talking to stage managers (and perhaps your union rep) early so that it's easier to address problems, should they come up. Because for a musician, protecting your ears is vitally important. Please share your stories and advise in the comments below. Vote: Have you ever felt the need to use earplugs to protect your hearing during a performance? October 30, 2015 at 01:39 PM · I usually wear an etymotic ETY plug in my left ear. 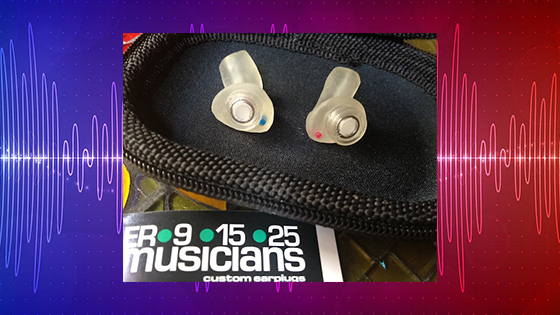 October 30, 2015 at 03:52 PM · I use earplugs regularly for practice sessions and definitely for small chamber work. One factor that made me stop doing orchestra work at 21 y/o: I found the high decibel levels intensely annoying. I would feel this way well before the volume got anywhere near the danger zone -- e.g., in the finales of Tchaikovsky 2 and 4. I didn’t get nearly the sound blasts Janet Horvath described, probably because I was safely away from brasses and percussion. Another place for dangerous volume levels: the gym. Don’t be afraid to nag management -- in a genteel way, of course -- to keep the music volume down to a reasonable level. I’m not afraid to do so, and my efforts have paid off. I have earplugs on hand, just in case. The main focus there is health and fitness -- not music; and the health and fitness of people’s eardrums -- not to mention nerves -- ought to be a priority. October 30, 2015 at 04:31 PM · Thank you for bringing this to everyone's attention. Hearing damage is irreversible, and it isn't talked about enough in our profession. I never play my violin (even in the practice room) or teach without at least one ear plug in my left ear. I often get asked about it by newer students, which is a great opportunity to teach them about the importance of saving hearing before it is lost. Unfortunately, I already have fairly severe damage to both ears after years of playing in symphonies. If you EVER hear the painful sound of the ocean roaring in your ears while playing, do something about it before it gets worse! There are several affordable brands of earplugs that can be bought online. They're around $10 a pair, are re-usable, usually come with a carrying case, and can come in different sizes. They still let in enough sound so you can hear yourself play, especially in an orchestral setting. This is an affordable alternative to going to the doctor and getting a specialty pair. If these don't help, then it is definitely time to see a doctor to get something that is better fitted to your specific ear shape. "Yes the ER's are the best we currently have on the market and I was wearing them with the 25dB filter - the strongest. :( The brain actually adapts to hearing normally with them over time - especially in younger people. Each time anyone experience that ringing and/ or pain is an indicator of a 'threshold shift' those tender ear follicles bending in the ear which can due to repeated assault, break causing injury." October 31, 2015 at 01:34 AM · @Laurie: I'm not completely following what Janet meant in her comment to you. Please explain about the threshold shift you referenced. Thanks! October 31, 2015 at 07:14 PM · Here is some more information about the term 'threshold shift'. I believe it is simply a change in the threshold of sound at which you can hear. Also, this definition of auditory fatigue also sheds light on the concept. November 2, 2015 at 09:35 PM · My daughter wears headphones when she practices. She likes that better than ear plugs. November 5, 2015 at 10:41 PM · Thanks for the post, Laurie. I'm planning to invest in a pair of Etymotic or ACS custom earplugs, as my violin is very loud under the ear and I will occasionally notice ringing in my ear after playing. Any guidance on whether I should go with the 9-10db, 15db, or 17db ear plugs? I mostly play chamber music, so I'm not as concerned about trumpets blasting in my ear as I am about my own violin. I would probably only put it in my left ear.